Special Pocket system ensures easy and trouble free washing of vials from outer and inner side. Indexing motion makes easier for syringes to move inside vial, when it is in stationery motion. No Change parts are required from 5 ML to 30 ML vial. Washing cycles can be adjusted as per customer requirement. 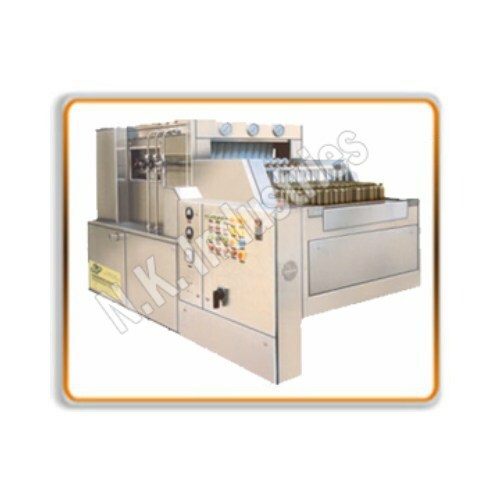 User friendly machine, even semi skilled operator can operate the machine very easily. A Special clutch device is incorporated for Stoppage of Machine in the event, vial is over turned or over diameter. Low RPM but High out put. Imported pumps are provided in the machine, which gives a good pressure to wash vials properly. Imported Gear Motor for Main drive and conveyor. A.C. Frequency drive for Main drive and conveyor. Pumps with tank (60 liters each) 3 nos. Up to 60 To 120 Vials / Min. 1.00 HP For Main Drive. 0.50 HP for each pump. 440 Volts, 3 Phase (4 wire System) 50 Hz. Copyright © 2019. N. K. Industries All rights reserved.